I wasn’t going to make any more computer-related purchases this year, but my trusted Logitech MX500 mouse decided to die (got like eight years usage out of it) and send me for upgrade. After some deliberating and checking actual availability I went for current top of the line (among general-purpose Logitech mice) Performance MX – large, wireless, 6-buttons (not counting wheel) mouse. Performance doesn’t stray far from discontinued Revolution MX. It has less in-your-face gloss, bu almost same proportions and control elements. application switch button, doesn’t look like button at all – just section of thumb rest that can be pressed. Receiver is one of those tiny things, barely sticking out of port and supports Unifying, meaning you can use multiple Logitech devices with single receiver. Mouse is powered by single rechargeable AA battery. It has no docking station and is charged through standard micro-USB jack that is positioned so it kinda turns it into regular wired mouse. You can keep using it while charging. Just how many years it took to make wireless mouse this usable? As far as I can tell cable isn’t used for data transfer (feature seen on gaming top of the line rival Logitech G700 ). Battery position makes mouse very unbalanced. It is fine on surface, but very awkward and uncomfortable to lift. My only gripe with cable is that it could me mini-USB instead, enough space on mouse and I use that one for my e-book reader. Hyper-speed scrolling wheel is no longer novelty, but clearly feature Logitech sees as important and worth implementing in all top mice. I actually have mixed feelings about this one. Scrolling itself works just fine. I don’t have constant need for fast scroll, but you can switch modes instantly with button without moving the hand. Problem is – such wheel obviously have much more complex mechanics inside. As result wheel click is very very stubborn. Some people online just regard it as defect of model. It works most of the time, but sometimes you don’t press hard enough or get angle wrong and it fails. Left/right scroll is weak as well. It’s hard to use and is flaky in some applications like Total Commander (I am not entirely sure is it because of hardware or software). Since MX500 used as ancient MouseWare and Logitech didn’t bother to include support for old models in SetPoint software it is new for me. It does all usual things like batter charge monitoring and button assignments, but there are some interesting extras as well. one of two possible task switcher functions is done in Mac/Expose style. It is far from that polished, but still interesting spin away from generic task switching in XP. you can create custom profiles for software so buttons have different contextual functions in different applications. For example I have back button set to Page Down in general, but in FeedDemon it acts as Ctrl+J shortcut, that jumps to next feed. Sadly one of my all-time favorite functions application recall (switch between two windows last used) seems to be gone. Non-expose switch works in similar way, but requires extra click for same result. 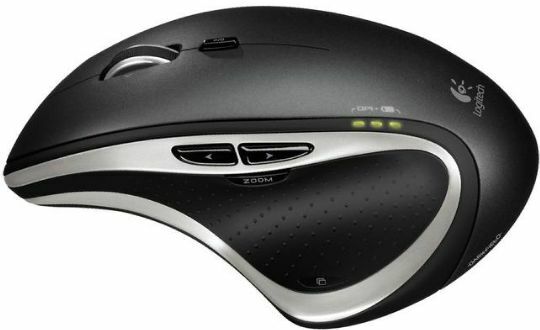 Very comfortable mouse and well-implemented wireless aspect. My only gripe is with wheel, I feel that Logitech had slightly compromised usability for hyper-speed scroll marketing. I could have gone for G700, killer buttons on that one… But doesn’t seem to be sold around here yet. I can mail you G700 if you want one :) Anyways, I’ve had two Revolutions now, and the left button failed with the first one, this seems like a common issue, I’ve heard about people having this problem. Nonetheless, I’ve bought the same model, used. And I’ve checked today, there’s plenty of them still available for a decent price of 70 euros, so I’ll probably get one of those as a backup. Nah, too many toys this year already. :) Getting used to Performance and tweaking buttons. Wheel aside it is really comfortable mouse to use.